Supergoop! Defense Refresh Setting Mist, 3.4 oz. 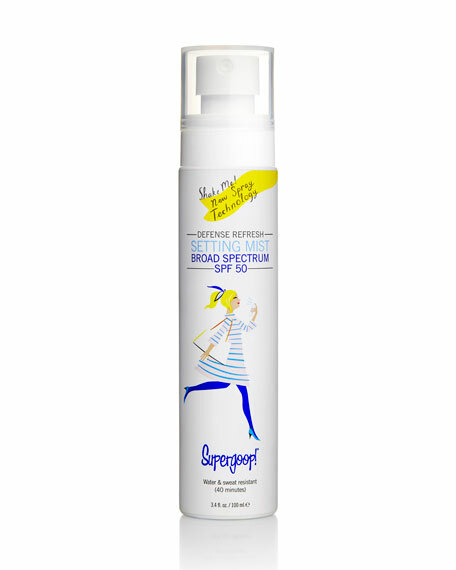 Supergoop!Defense Refresh Setting Mist, 3.4 oz. Matte finish three-in-one mist sets make-up, controls oil, and delivers UV photoaging protection. DEFENSE REFRESH SETTING MIST SPF 50 is a unique three-in-one weightless mist that sets make-up, helps control oil & shine and refreshes your defense against photoaging UV rays. With antioxidant-rich rosemary and mint to help improve skin's complexion and deliver an invigorating essence, this is your perfect pick-me-up for fresh, flawless, sun-safe skin throughout the day.